You don’t have to be an expert yourself to spot these mistakes and get them corrected while it’s still easy to do so. ● Proper drainage is important. Discuss this issue with your landscaper until you are satisfied with his drainage plan. This photo shows flexible drainage pipe which is installed underground before the final grade. 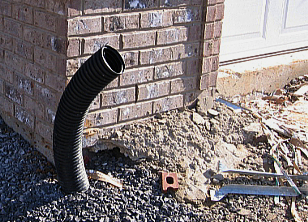 The pipe will be tied to the end of the downspout, taking rainwater to empty at the curb. ● Before sod or seeding, make sure all ground is sloped sufficiently and with no low spots, so that water will drain away from the house and toward the property lines. Your landscaper should use a transit during the sloping process to ensure accuracy. ● Final grade should be smooth with no sizeable rocks or dirt clumps remaining. ● Plants are measured by the gallon and trees by the caliper. Be sure that the sizes are specified in your agreement with the landscaper, and that the correct sizes are actually delivered to your house.